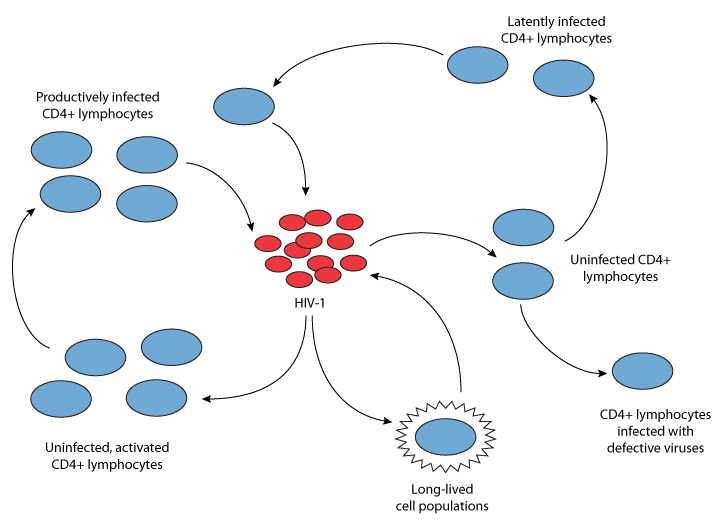 This CellML model represents the second model in the published paper (which includes the effects of treatment with ritonavir). The model runs in both COR and PCEnv, the units have been checked and they are consistent. The simulation output from the CellML model looks reasonable, however we were unable to check it against the original model results as the paper does not contain any simulation graphs. Please note that the value of the initial condition of T_star and the parameters k and N were not definied in the paper so these have been set to 0, 2.4e-5, and 774 respectively, according to the values which were defined in Perelson et al. 1993. ABSTRACT: A new mathematical model was used to analyze a detailed set of human immunodeficiency virus-type 1 (HIV-1) viral load data collected from five infected individuals after the administration of a potent inhibitor of HIV-1 protease. Productively infected cells were estimated to have, on average, a life-span of 2.2 days (half-life t 1/2 = 1.6 days), and plasma virions were estimated to have a mean life-span of 0.3 days (t 1/2 = 0.24 days). The estimated average total HIV-1 production was 10.3 x 10(9) virions per day, which is substantially greater than previous minimum estimates. The results also suggest that the minimum duration of the HIV-1 life cycle in vivo is 1.2 days on average, and that the average HIV-1 generation time--defined as the time from release of a virion until it infects another cell and causes the release of a new generation of viral particles--is 2.6 days. These findings on viral dynamics provide not only a kinetic picture of HIV-1 pathogenesis, but also theoretical principles to guide the development of treatment strategies. Schematic diagram summarising the dynamics of an HIV-1 infection in vivo. Derived from workspace Perelson, Neumann, Markowitz, Leonard, Ho, 1996 at changeset 969e0fd78645.